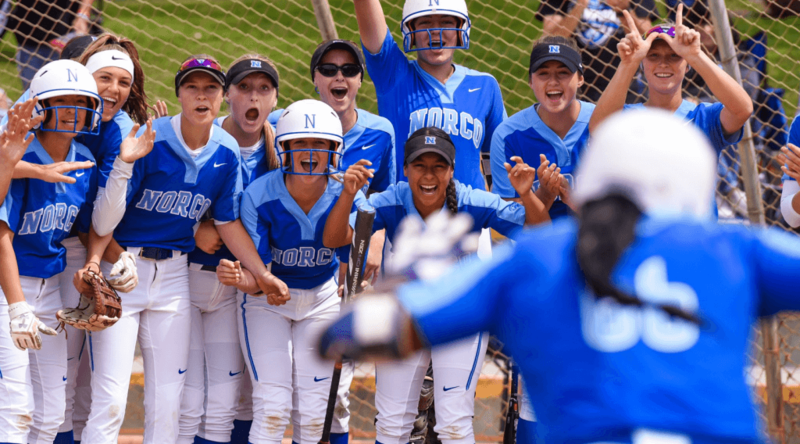 Norco players celebrate a home run by Sarah Willis in action today at the Carew Classic. The first weekend of April usually finds a number of top teams from around the nation involved in some of the best tournaments in the nation. At the Michelle Carew Classic in Anaheim, Calif., national No. 1 Norco will go from playing one unbeaten team last Saturday to another when it opens on Wednesday against Rio Mesa of Oxnard (Calif.). The Cougars blanked previous national No. 4 Mater Dei Catholic (Chula Vista, Calif.) 5-0 last Saturday on a shutout by Washington-bound Sarah Willis. Rio Mesa (13-0) features Utah committed junior Alicia Estrada and moved up to No. 35 in this week’s Extra Elite Eighty. Mater Dei Catholic hopes to get another shot at Norco at the Carew Classic. Our favorite opener of the event may be national No. 18 Great Oak (Temecula, Calif.) vs. No. 32 Grand Terrace (Calif.). Will one of these teams this weekend be Great or Grand? Among those also entered are Extra Elite Eighty ranked squads Pacifica (Garden Grove, Calif.) and Los Alamitos (Calif.). Los Al would have been much higher in this week’s rankings except the Griffins were upset on Tuesday by Edison (Huntington Beach, Calif.). The annual Roger Jones Kissimmee Klassic in Florida also takes place this weekend. 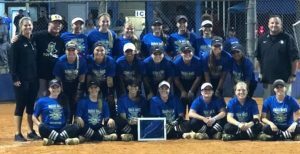 The Blue Division is the one that has the highest-ranked teams and among those in it will be Extra Elite Eighty ranked Oakleaf (Orange Park, Fla.); Bartow (Fla.); and Pembroke Pines Charter (Fla.). National bubble team Gainesville (Fla.) also is competing. A possible matchup of the top two teams in Northern California at the 25th annual Livermore Stampede this weekend lost some of its polish when previously unbeaten Archbishop Mitty (San Jose, Calif.) was upset on Tuesday by Valley Christian (San Jose). The Monarchs still may face national No. 4 Foothill (Pleasanton, Calif.) in the final on Saturday. For this week’s rankings, two previously unranked teams who’ve shot their way upward would be new No. 12 Santa Margarita (Calif.) and new No. 25 Estero (Fla.). Santa Margarita has had a strength of schedule issue compared to some of the other top California teams and lost in its first game with league rival Orange Lutheran. In a rematch between the two last week, though, the Eagles won 1-0 behind the strong pitching of University of Pennsylvania-bound Bella Fiorentino. With other upsets around the state, that avenging win has caused Santa Margarita to jump way up there. Estero was a 27-4 squad from last season that is now looking like one of the best in Florida. The team’s best wins have come against Fort Myers and American Heritage (Plantation, Fla.) but it hasn’t played any of the other teams from Florida that have been mentioned in the Extra Elite Eighty. Still, Estero goes in this week unbeaten (16-0) at No. 25. Junior pitcher Alex Salter is 7-0 with a 0.34 ERA and has committed to Alabama. But the other pitcher, junior Lauren Hobbs, can get it done as well. Hobbs is 9-0 with a 0.26 ERA. For teams in cold weather states that still hadn’t played yet coming into this week or that may not play for another week, those teams continue to be ranked in the same spots they were placed in the preseason. There were games played for the top teams in Ohio, Indiana, New Jersey and elsewhere from last weekend and some from even on Tuesday of this week. Just about everyone should be playing by the end of this week.